I recently came across a smartphone which advertises the support for 4K. I was about to buy it, but then I noticed that its display resolution is only 1080 x 1920 pixels. 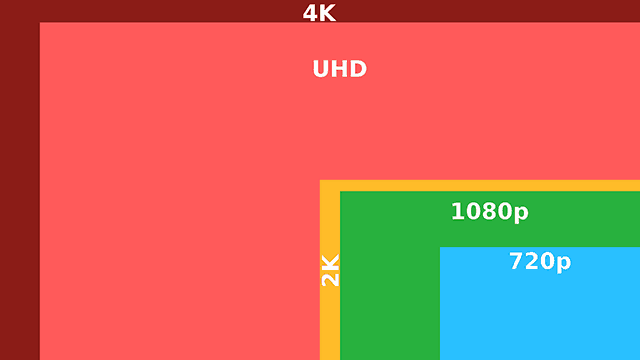 As far as I know, 4K is equivalent to a resolution of 3840 x 2160. How is it possible? Am I missing something here? While this might seem to be a silly question to someone, we felt that many of us might have the same confusion. So, in this article, we’ll try to explain this, along with a few other misconceptions around 4K on portable devices. We’ll also list down some of the popular smartphones that feature 4K resolution. There are primarily two ways to denote video or display resolution. One method considers the horizontal pixels as the standard for measurement, while the other considers the vertical ones. When horizontal pixels are considered, the resolution is denoted by the letter ‘K’ (2K, 4K, 8K, etc.). In case of vertical pixels (or, horizontal lines of vertical resolution), the resolution is denoted by letter ‘p’ (360p, 720p, 1080p, etc.). By definition, a 4K display or content should have the number of horizontal pixels in the order of 4000. Going by this definition and maintaining a fixed aspect ratio, the native 4K resolution is measured as 4096 x 2160 (at a 19:10 or 1.9:1 aspect ratio). But this is not the only standard 4K resolution available in the industry. By varying the aspect ratio, multiple resolutions have been standardized that qualify as 4K. The lowest standard 4K resolution is 4096 x 1716 (2.39:1 aspect ratio), which is also known as Cinemascope (cropped). If you go through the detailed specifications, you’ll find that most smartphones have adopted the 3840 x 2160 resolution as 4K standard. For a typical geek though, such a resolution (3840 x 2160) does not contain 4000 pixels horizontally, and hence, is not a 4K but rather a 2160p resolution. So why is 3840 x 2160 considered as 4K at all? Both the native 4K (4096 x 2160) and 3840 x 2160 resolutions have 2160 pixels vertically. Hence, both can be denoted as 2160p. Another interesting fact is that the total number of pixels (8.3 million pixels) in 3840 x 2160 resolution is higher than that (8 million pixels) of the lowest 4K standard (4096 x 1716) resolution. Hence, considering both the facts, as well as for its own convenience, the industry has also adopted the UHDTV (3840 x 2160) resolution as a 4K standard. Now it’s up to you to decide whether to consider 2160p as 4K or go by the standard definition. A common confusion about 4K supported device is, whether this support applies to the device’s playback / recording capability, or rather the display itself. A smartphone capable of playing and recording 4K videos does not necessarily mean that it has a 4K display. Generally, a smartphone can play and record videos at a higher resolution than its display resolution. But what happens when you play a higher resolution video on a comparatively lower resolution display? When you play a higher resolution video on a lower resolution screen, the hardware and software of the particular device downscale the video to match its display resolution. This is done by approximation of pixel attributes among adjacent pixels in the video. The level of approximation depends on the ratio between the video resolution and the actual display resolution. So you can’t really enjoy a 4K video without a 4K display. A number of smartphones available today support video recording and playback at 4K resolution. Technically, for recording a video in 4K, both hardware and software play a major role. The smartphone camera should have at least an 8 megapixel sensor to capture videos in the lowest 4K standard . And to record videos in native 4K (4096 x 2160), the camera sensor should be 8.8 megapixel or more. 4K recording also requires suitable processing power. As of this writing, all 4K-recording capable smartphones are powered by either Qualcomm Snapdragon 800 or its successors (or an equivalent) processor. This is an Android device launched with Android 4.4.2 KitKat and currently upgradable to Android 5.0 Lollipop. It has a 2.5 GHz quad-core Krait 400 Qualcomm Snapdragon 801 processor with an Adreno 330 GPU and 2GB RAM (3GB variant also available). The display resolution of this device is 1440 x 2560, with a pixel density of ~538 PPI. It has a 13 MP rear camera with dual-LED flash, capable of recording 3840 x 2160 (4K) video at 30fps. It also has a secondary front facing 2.1 MP camera capable of 1080p video recording at 30fps. This is a Windows Phone device which is capable of native recording 4K videos with the Lumia Denim update (Windows Phone 8.1 Update 1) running on the device. It runs a 2.2 GHz quad-core Qualcomm Snapdragon 800 CPU with an Adreno 330 GPU and 2GB RAM. It has a display of 1080 x 1920 with ~441 PPI pixel density. It has a primary camera of 20 MP with video recording capability of 2160p (3840 x 2160) at 30fps. There is also a 1.2MP front facing camera that is quite good for Skype and other video calls. This is also a 4K-capable Windows Phone device which can record 4K videos natively after receiving the Lumia Denim update. Under the hood, it has a 2.2 GHz quad-core Qualcomm Snapdragon 800 CPU with an Adreno 330 GPU and 2GB RAM. The display resolution of this device is 1080 x 1920 with ~367 PPI pixel density. Its primary camera of 20 MP is capable of recording 2160p (3840 x 2160) at 30fps and 1080p at 30fps. Additionally, it has a secondary 1.2 MP camera which can record 720p video at 30fps. Nexus 6 runs the latest version of Android (Lollipop 5.0) and thus natively supports 4K video recording. It has a display resolution of 1440 x 2560 with a pixel density of ~493 PPI. Powered by a 2.7 GHz quad-core Krait 450 Qualcomm Snapdragon 805 CPU and Adreno 420 GPU, it is one of the most powerful smartphones available today. It also has a 3GB LPDDR3 RAM to boost the performance. The primary camera has a 13 MP sensor capable of recording 2160p (3840 x 2160) videos at 30fps. A front-facing 2MP camera is also available on the device. This is another device that is currently running the latest version of Android (Lollipop 5.0). The display resolution is 1080 x 1920 with ~424 PPI pixel density. Under the hood, it has got a 2.5 GHz quad-core Qualcomm Snapdragon 801 CPU, Adreno 330 GPU and 2GB of RAM. At the back, its 13 MP autofocus camera with dual-LED flash is capable of shooting 4K (3840 x 2160) videos at 30fps. There is also a 2MP front-facing camera for making video calls. This is currently the only smartphone that is capable of shooting true 4K resolution videos. It’s runs CyanogenMod 11S OS, which is a custom version of Android 4.4.4 KitKat. It has a 1080 x 1920 resolution display with ~401 PPI pixel density. It’s powered by 2.5 GHz quad-core Krait 400 Qualcomm Snapdragon 801 CPU and Adreno 330 GPU, along with 3GB of RAM. It’s 13 MP shooter with dual-LED flash supports true 4K video recording (4096 x 2160 pixels) at 24fps, conventional 4K video recording (3840 x 2160 pixels) at 30fps and 1080p video recording (1920 x 1080) at 60fps. Additionally, a 5 MP secondary camera is also present in front, which is capable of 1080p video recording at 30fps. This is one of the new smartphones capable of 4K video recording. It runs Android KitKat 4.4.4 version, and is upgradable to Lollipop 5.0. Display-wise, it has 720 x 1280 resolution screen with ~312 PPI pixel density. Inside, it has a 2.5 GHz quad-core Krait 400 Qualcomm Snapdragon 801 CPU and Adreno 330 GPU, along with 2GB of RAM. There is a 12 MP camera at the back, capable of shooting 2160p (3840 x 2160) videos at 30fps, 1080p at 60fps and 720p at 120fps. There is also a secondary 2.1 MP camera in front. This smartphone runs Android KitKat 4.4.4 version, and is upgradable to Lollipop 5.0. The display resolution of the device is 1440 x 2560, with a pixel density of ~515 PPI. On the inside, it packs a quad-core 2.7 GHz Krait 450 Qualcomm Snapdragon 805 CPU with Adreno 420 GPU and 3GB of RAM. As for the primary camera, it is a 16 MP shooter with LED flash. Supported video recording resolutions include 2160p (3840 x 2160) at 30fps and 1080p at 60fps. The secondary camera has 3.7 MP sensor for good quality video calls. The Galaxy S5 runs Android 5.0 Lollipop and has a display resolution of 1080 x 1920 with~432 PPI pixel density. It has a 2.5 GHz quad-core Krait 400 Qualcomm Snapdragon 801 CPU and Adreno 330 GPU under the hood, along with 2GB of RAM. Its camera is a 16 MP shooter capable of taking video shots of 2160p (3840 x 2160 pixels) at 30fps, 1080p at 60fps and 720p at 120fps. The secondary camera is also a 2 MP shooter with 1080p video recording capability at 30fps. The Xperia Z3 has a display resolution of 1080 x 1920 with a pixel density of 424 PPI. It runs Android 4.4.4 KitKat, which is upgradable to Android 5.0 Lollipop. Inside, it has a 2.5 GHz quad-core Krait 400 Qualcomm Snapdragon 801 CPU, an Adreno 330 GPU along with 3GB of RAM. The primary camera is 20.7 MP shooter that is capable of recording 2160p (3840 x 2160) videos at 30fps, 1080p at 60fps and 720p at 120fps. It also has a secondary 2.2 MP camera capable of 1080p video recording at 30fps. These are some of the smartphones that officially support native 4K video recording. If a smartphone doesn’t have native 4K support but its internal hardware is capable of doing so, suitable third party apps might help to record 4K videos on such device. For example, the Apple iPhone 6 and 6 Plus don’t support 4K recording natively, but you can still record 4K videos on these devices with the help of third party apps. It’s still an ongoing debate whether it’s feasible to put a 4K display on a smartphone. 4K displays usually require a lot of power; so much that in fact, it drains almost twice the battery as compared to a 2K display. Also, 4K displays are good for large screen devices, but on a small screen, the difference between a 4K and a 2K display are hardly noticeable to the naked human eye. Another important factor is that 4K videos require more storage. If 4K becomes the new standard of video recording, the amount of space required to hold the recordings would be huge. Nevertheless, some hardware manufacturing companies like Samsung and Qualcomm are working hard to bring the 4K display to the smartphone. There are also several ongoing researches related to increasing smartphone battery life, or enable fast charging. If a feasible solution is found in the near future, maybe new smartphones with 4K displays will also start arriving in the market.